Thanks to Nuffnang, I was invited to watch the movie premiere of “Turbo” by Dreamworks Animations. 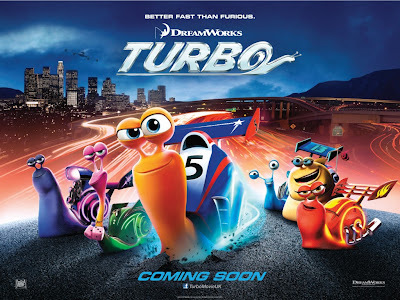 "Turbo" is a decent movie with a lot funny moments which might only work on kids or adults who would enjoy some innocent fun. Plus, it has some meaningful messages aimed at inspiring the kids to never give up in life. The movie is good enough to cheer your day with some laughter and simple joy! How fast can Turbo runs? The brotherly moment between Turbo and his bro, Chet! Overall, it is still an entertaining movie which you and your kids would enjoy! - Expect to listen to cool voice acting by some artists which you know of such as Ryan Reynolds, Samuel L. Jackson and even Snoop Dog! - You might feel like eating Escargot after the movies. How bout kids? They might think of petting a snail.